On Saturday last (8th November), Youghal welcomed Fermoy to Frogmore for the first home game of the season and what a day it was. After the flooding earlier during the week the rain held off and some fabulous rugby was played by both sides. We would like to thank Fermoy for making the trip and for being the good sports that they are. The Minis section would also like to say a massive thank you to all the parents who brought up sambos/cakes/bikkies, and generally helped make our opening home game a day to remember – just to let you all know that the bar has been set extremely high!! The spread we put on for our visitors was a veritable feast and between the food/hot chocolates/boot exchange/shop, the club was absolutely buzzing – just the way it should be so well done to all involved. The support we are getting this year from the parents is absolutely outstanding and was well noted by all the home players and also the opposition. Thank you very much and keep up the great work. Check out the photos on our facebook page – Youghal RFC Minis. Training next Sunday (November 16th) @ 11.15am, new members are always welcome. Fermoy tip off, great pressure from Rian and Dylan produces a turn over with Aaron getting the ball and passing to Kelly with some fine running by Fionn gets the games first try. Fermoy tip off with some fast running gets their first try. Youghal tip off with some great running Evan and Nadia O’Shea Jacob spreading the ball well for Nadia Fitzgerald to get a fine try. Fermoy tip off moving the ball fast out to the wing get their second try. Youghal tip off there’s a turn over and Fermoy move the ball fast but with brilliant tackling Nadia and Dylan saves a certain try. Half Time. Youghal tip off with Aaron getting the ball and with great footwork evades three tackles spreads the ball to Kelly who passes to Conor who goes over for a great try. A lot of tough tackling going on now with every player going in hard and fair. Next phase of play sees Fermoy getting a try. Youghal tip off nearly every Youghal player got their hands on the ball before getting a great try. Fermoy tip off and from good running gets a try to finish the game. It was a great game with some ferocious tackling by all. Our under 9’s played their first home game of the season last Saturday, and gave a brilliant performance against Fermoy. Our three new players, Kieran, Jason and Ronan really proved themselves with Jason even scoring a try, and Kieran Ryan setting up two more. Bobby Nicholson scored our first try of the game and also went over for two more over the course of the match. Ryan Hamill and Daire O’Flynn couldn’t do anything wrong and Daire also scored two tries. Fionn Dalton, Tadhg Fitzgerald and Lui Phibbs are improving with every game (I think their parents were watching) and a few more training sessions they will be pushing for places on the Munster side. Jamie had a great game as usual and the ref really liked him as he was talking to him a lot. Well done Jamie! After a terrific game the Youghal boys ran out comfortable winners 12 tries to 2. Team: Bobby Nicholson, Daire O’Flynn, Fionn Dalton, Tadhg Fitzgerald, Oisin Ryan, Kieran Ryan, Jamie Lee, Jason Innes, Lui Phibbs, Finn O’Brian, Ryan Hamill and Ronan Keane. Our under 10’s welcomed Fermoy last Saturday to Frogmore for the return leg of this friendly rivalry. Our boys were looking for another great performance against Fermoy this time on their own turf. Youghal were immediately on the back foot playing up against the hill and elected to give Fermoy the opening kick off as Fermoy pressured early on using the hill to their advantage, super tackling from Asia Lupton and Charlie “I only missed a few” O’Brien kept Fermoy at bay. Brilliant rucking from Mark O’Neill allowed Youghal to return fire with quick play from Ciara Kennedy and strong running from P.J Morgan almost saw Youghal go over for a try. Fermoy’s excellent rucking allowed them to attack Youghal on the back foot which saw them go over for two tries before the interval. The second period began with Youghal on the offensive thanks to superb running rugby by Alex Kennedy and Nathan O’Halloran who were supported by Ciara Hodnett who led from the front all morning. Fermoy quickly retaliated but some excellent defending by the Youghal team led by Jack Finn who was outstanding all game, kept Fermoy scoreless in the second period. At the start of the third period Youghal were clearly exhausted from their great performance so far but playing up against the hill, Fermoy in fairness exploited this and were able to bring fresh legs on throughout the game which enabled them to sneak in for two quick tries. After a quick team talk Youghal found some bit of energy from somewhere, probably from Emily Gallogley whose fast tempo approach had Fermoy in trouble. Youghal seemed to be on top around the park with great running coming from Daniel Murray complimented by Kyle Fitzgerald’s strong running saw Youghal show the cracks in Fermoy’s strong defence as time ran out. This group of players continue to grow and improve each week and hopefully this will continue with training next Sunday. Team: Ciara Hodnett, Emily Gallogley, Jack Finn, Mark O’Neill, Asia Lupton, Ciara Kennedy, Daniel Murray, Alex Kennedy, Kyle Fitzgerald, Charlie O’Brian, PJ Morgan and Nathan O’Halloran. Apologies for the confusion but due to circumstances beyond our control, we have had to change the date of the quiz to the 21st November. As always, your support would be greatly appreciated. On Saturday the 25th of October Youghal Under 16s opened their league campaign with an emphatic victoy over Old Christians. On a day when Youghal did most of the right things right, they won 59-12. Tackling was much improved on early season matches and great passing and strong running saw Youghal run in nine tries. The forwards held their own in set pieces but good support play and pressure in open play gave Youghal a huge boost. Wing forward Jordan Yellop scored five tries, Nr 8 David Kenny Farrell got one, full back Jack Monaghan got one and centre Diarmuid Clancy got two tries and seven conversions. Next league match is away to Midleton on the 8th of November. Well done to all the Youghal squad. Hopefully their great spirit will see them continue on their winning ways. After a first round walkover, our u14s got their league campaign off to a start with a home game against Kanturk on Sunday 26/10/2014. With an 11am kick-off, the game started with a strong wind blowing from the School side of the pitch. There were many highlights in the game, including some good play from our backs and forwards, which lead to our first try with only a few minutes of the game played. After some good rucking and ball retention from the forwards the ball was released to the backs where Padraig Quilligan made a good line break only to be tackled on the 22 where he off loaded the ball to Evan Villis who touched down in the corner. The difficult conversion from the touchline was unsuccessful through no fault of the kicker. Our second try came from good play from the forwards and halfbacks with outhalf Padraig Quilligan making a good break through the Kanturk backline and scoring in the corner, again this try went unconverted. The third try of the first half was again scored by Padraig who showed good strength in fending off some tackles before crossing the line in the corner and touching down under the posts. This try was converted. The last action of the half saw Kanturk cross for a second try after keeping Youghal pinned in their 22 for a sustained period. Halftime score 17-10 to Youghal. The second half started as the first ended with Youghal under pressure in their22 until some good forward work saw Youghal reclaim the ball and carry it to the 22, where after a ruck the ball reached Oran Finn who made a great break to score in the corner. 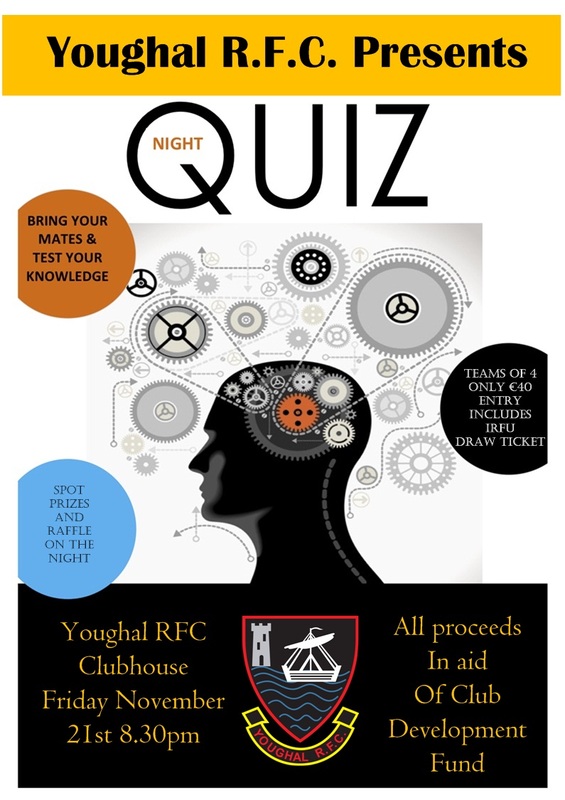 The final score of the game for Youghal came from some good play from Youghals forwards and backs who retained the ball through a number of phases, the ball then reached Padraig on the Kanturk 10 meter line, he then broke a number of tackles to score under the posts. The game ended with Youghal once again under pressure in their own 22 with Kanturk trying their best to break through a good defence. Through some good work, Youghal managed to turn over the ball and with only seconds left in the game Kelvin Yellop took the initiative and kicked the ball to touch and end the game. The final score 29-20 to Youghal. All players showed some good skills and hard work during the game, which bodes well for the remaining games in the league. A thank you from the team also goes out to the great support from parents and others on the sidelines during this game. Kelvin Yellop, Jordan Lupton, Michael Aherne, Ryan Hennessy, Tristan Hennessy, Zack Ansbro, Cian Walsh, Tomas Power, Olan Coleman, Padraig Quilligan (C), Evan Villis, A.J Brophy, Dean Colman, Oran Finn, Ben Ingamels, Daniel Cronin, Darragh Coleman, Josh Sheridan, Aron Gardiner. Training for the Under 14s continues every Tuesday and Thursday at 6:00pm until 7:15pm. New players born in either 2001 or 2002 are always welcome contact Colin Hayes on (087) 6245530.